What happens to your skin when you travel or when the season changes? It becomes itchy, harsh and rough. 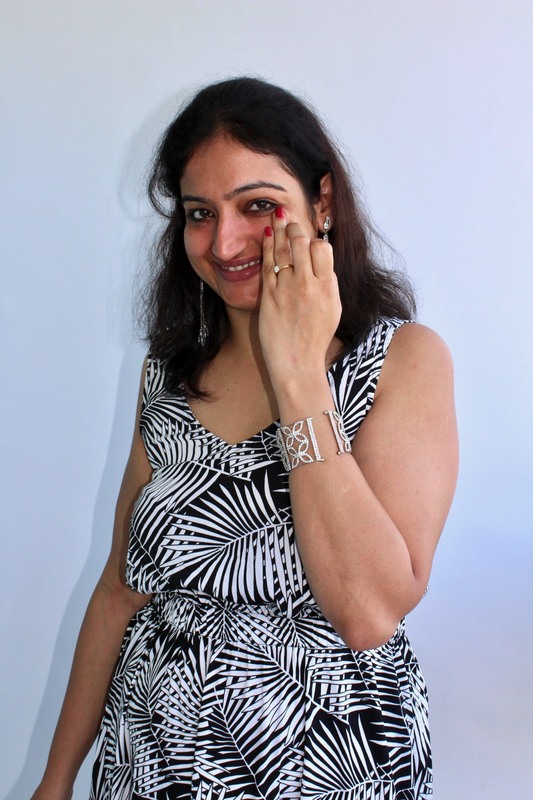 When I travelled from Delhi to Thailand, my skin experienced similar ailments. 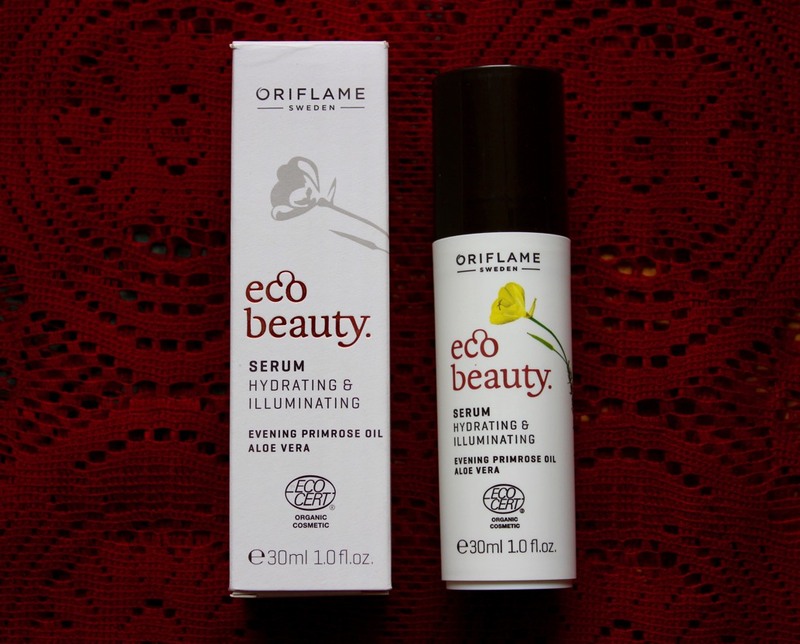 To protect it from sudden season change (Delhi being cold at that moment to Thailand being pleasant), I had Oriflame’s Eco Beauty range to my rescue which is made from natural ingredients like cornflower sunflower, rose chamomile, evening primrose oil, aloevera, lingonberry and sea buckthorn to protect your skin. Launched in January 2017, it aims at protecting and keeping the skin natural and glowing. 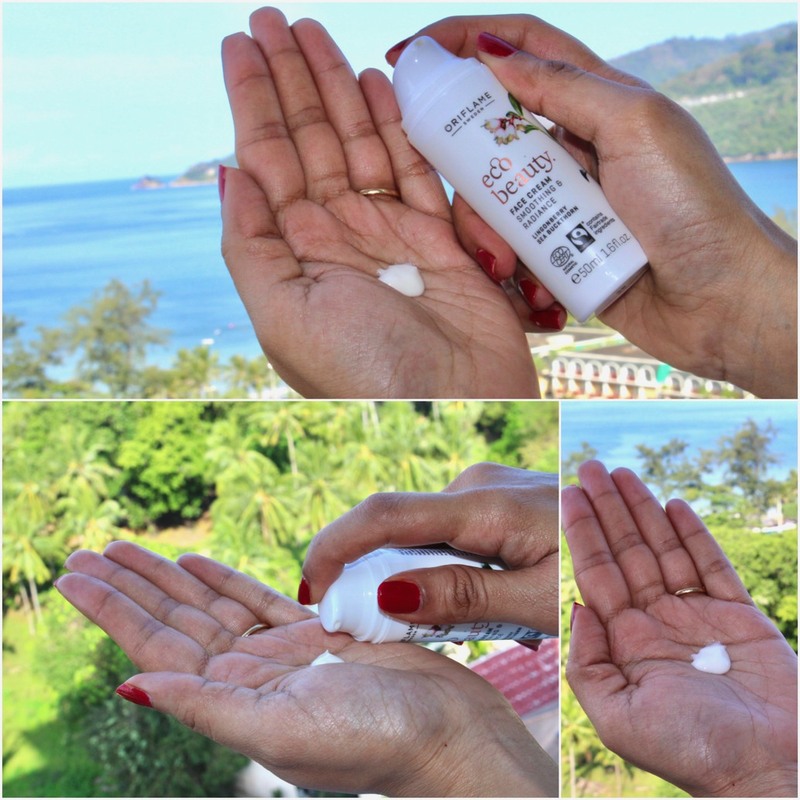 So let me tell you more about the EcoBeauty range followed by my CTM (cleansing toning and moisturizing) routine while I enjoyed the city of beaches, scenic beauty and shopping. 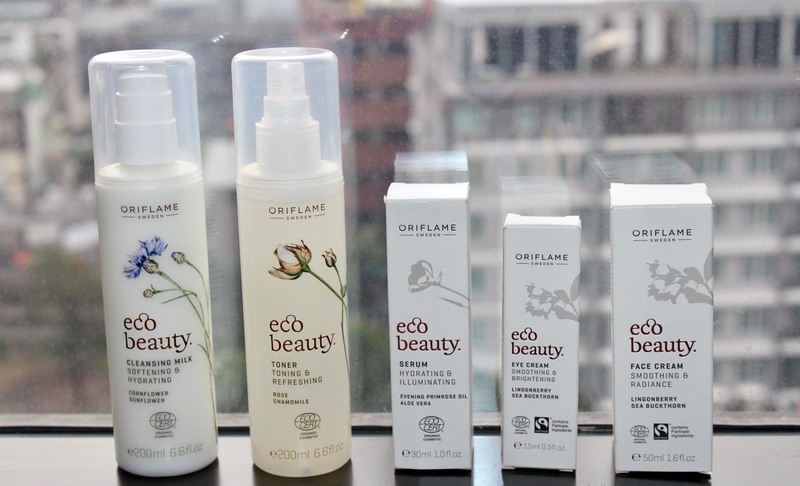 Oriflame India’s “Ecobeauty” range is infused with organic ingredients and extracts. With the brand’s finest offerings, we get to experience a healthy, radiant and natural skin over time. 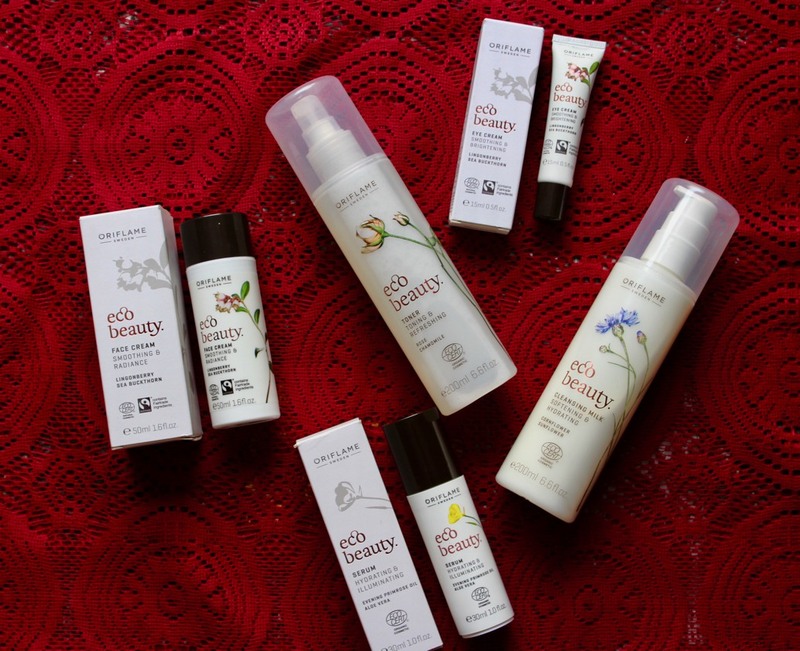 The brand brings to you their latest breakthrough with the all new “Ecobeauty” range which is free from parabens. This unique range provides the skin with all the essential building blocks to maintain its radiance and health in the most natural way possible. Using the full routine has been clinically tested to deliver better results. The range has a cleansing milk, toner, eye cream, serum and face cream which deeply moisturizes, hydrates, refreshes and nourishes your skin. These products are rich in nutrients, vitamins & antioxidants and are specifically designed to complement each other! It also addresses different needs of your skin. Now, coming to CTM, this is one important routine that each one of us should follow but considering our schedules we take things lightly. 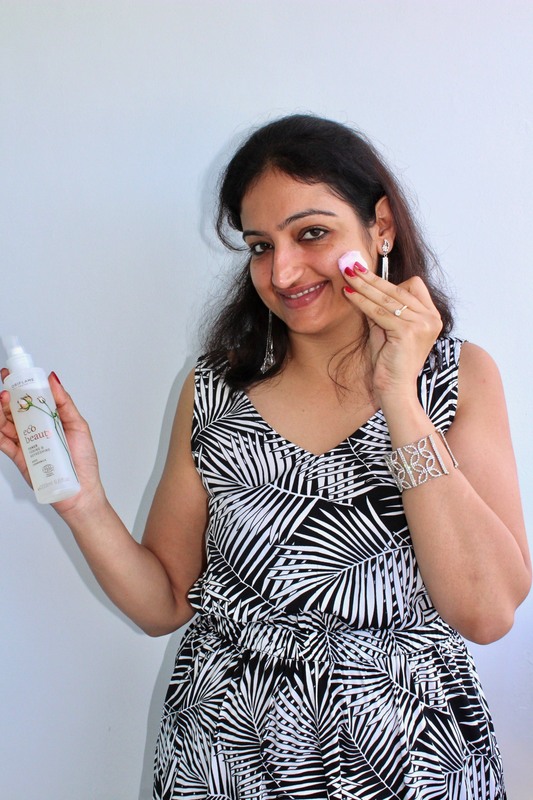 However, when I saw the EcoBeauty range, I felt tempted to try them out owing to the natural ingredients and fragrance they have. 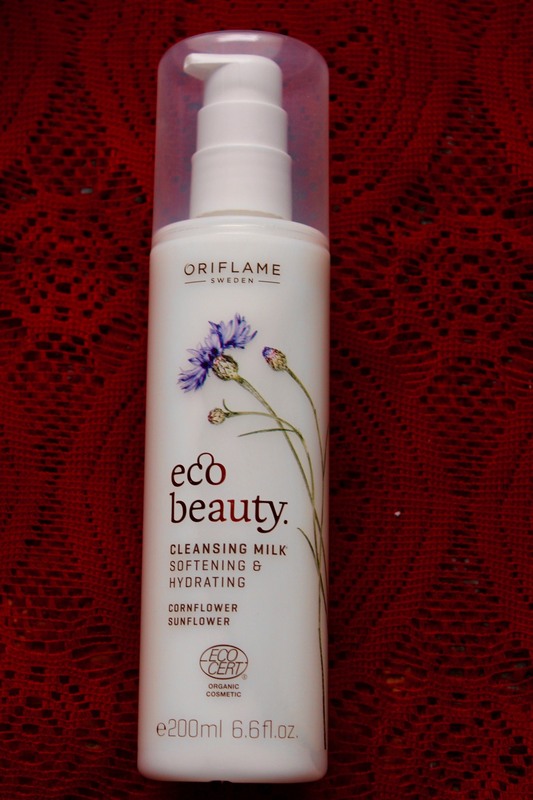 The Ecobeauty Cleansing milk is Praben free and melts away make up with nourishing creaminess. It is not too oily yet does not leave the skin dry! One can use it to remove make up or impurities. In the picture, I tried it right after a shower before I apply my make up so that in case any impurities or dirt is left on my face, the cleanser can cleanse it off! It is infused with soothing Organic Sunflower Seed oil and soothing Organic Cornflour Water to protect and condition skin. It left my skin soft, smooth and clean! You just need to apply it gently on the face and neck avoiding direct contact with the eyes. In case you need to remove your eye make up, just apply a few drops of cleansing milk to a cotton pad and gently wipe over the eye area. Wait for a minute before the next step! Don’t we at times feel that that even after cleansing the face, there is still make up on. 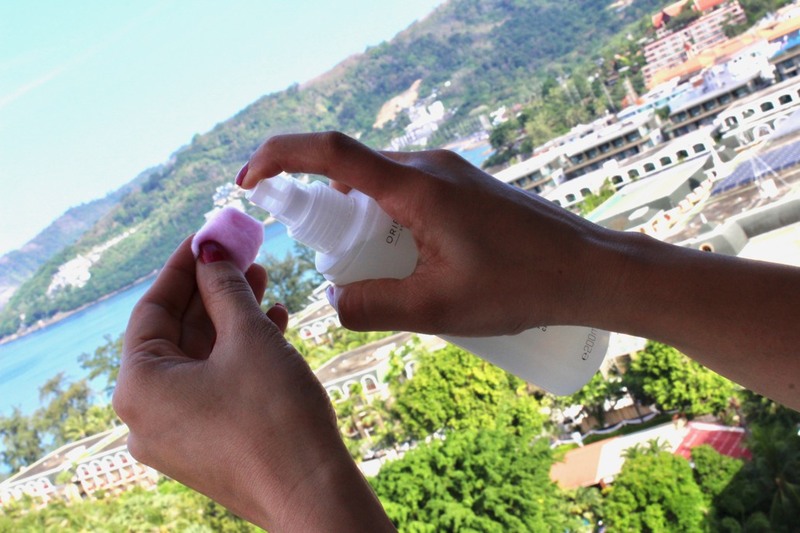 So follow the cleansing regime with EcoBeauty Toner. 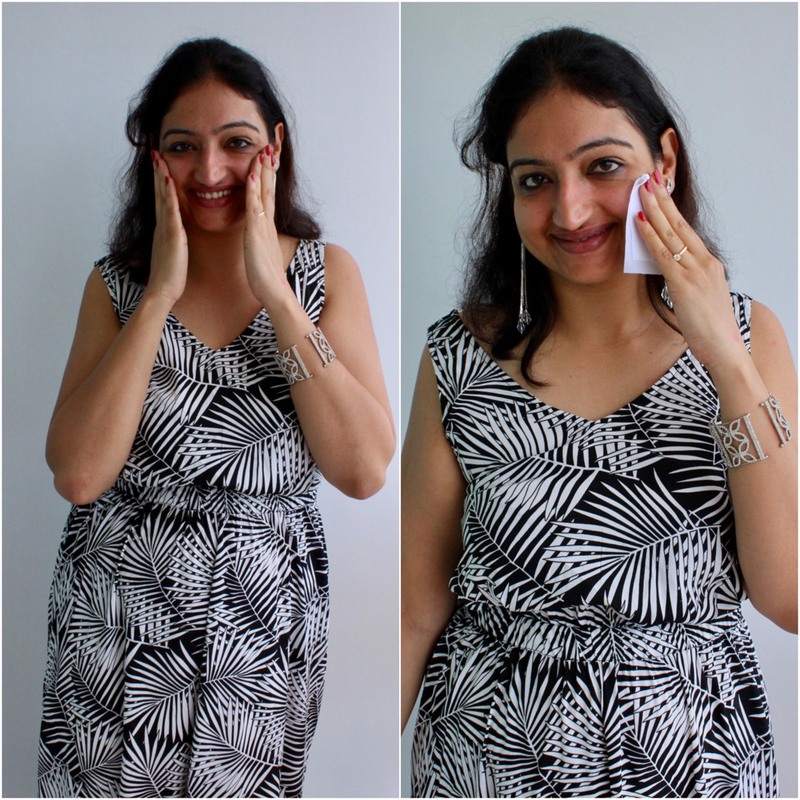 You just have to spray toner on cotton pad and wipe off remaining make up or residue! 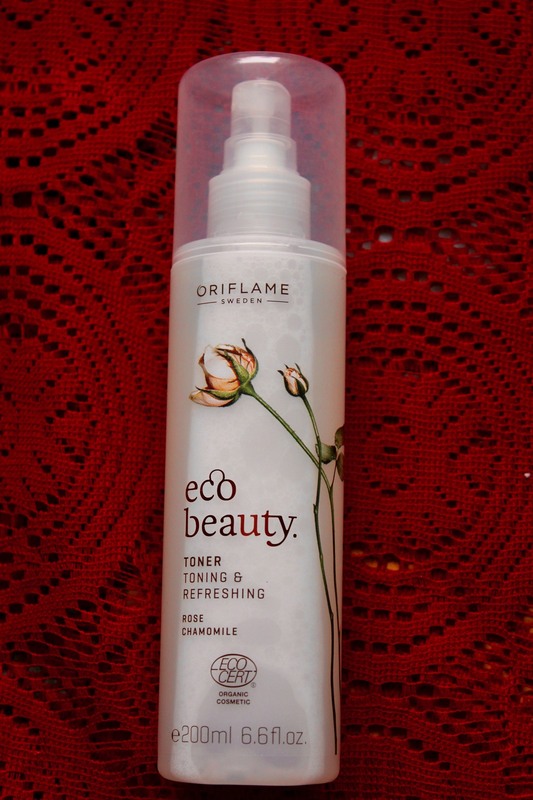 The refreshing, gorgeously scented toner from the EcoBeauty range of Oriflame cheers up unhappy skin with Organic Rosewater and Chamomile Water. Infused with antioxidant-rich ingredients, this toner helps soothe and soften skin, so it feels supple, exhilarated and happy again. Isn’t this just what you need at the start of the day or when you retire after a long day at work. However, this is one of the most important step. Absence of this step would mean that the atmosphere will pull moisture away from the surface and with it moisture from within the skin, leaving it dehydrated. Wait three minutes before the next step. This is the latest addition to the CTM routine. Let me start by telling you what a serum is. A serum is an ultra intensive, lightweight formula that can deeply penetrate the skin as it contains molecules that are much smaller than those in a moisturizer. This is to treat your skin to an illuminating boost every day. The light, cooling serum from EcoBeauty is inflused with antioxidant rich organic Evening Primrose Oil and moisture rich Aloe Vera extract. It melts into skin and helps to feed the skin with extra moisture. It is designed to leave skin instantly more radiant, revived and refreshed. Perfect for preparing your skin for face cream or an overnight treatment! 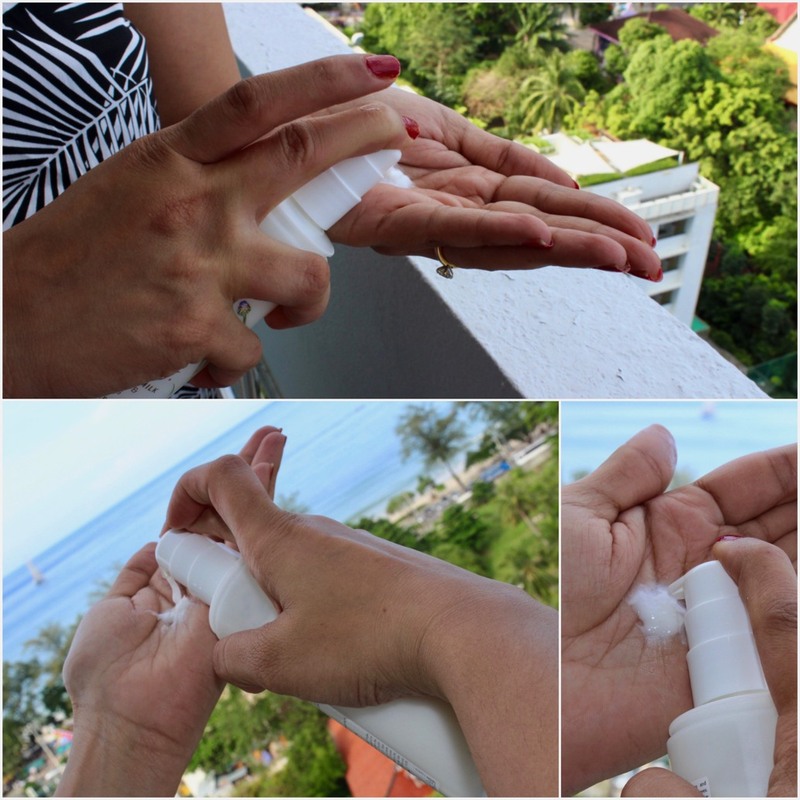 Apply three drops in the palm of your hands and massage into dry skin until fully absorbed. Wait one minute before the next step. We all know how sensitive is the area around the eye. It is actually one tenth of the density of the skin on the face, so the eye product has to be lighter than a moisturizer. Now say goodbye to tired looking eyes! The hydrating eye cream revives and brightens the delicate eye contour area. Powered with antioxidant rich Arctic Lingonberry and Sea Buckhorn Seed Oils to help re-energize skin as it diminishes signs of fatigue. 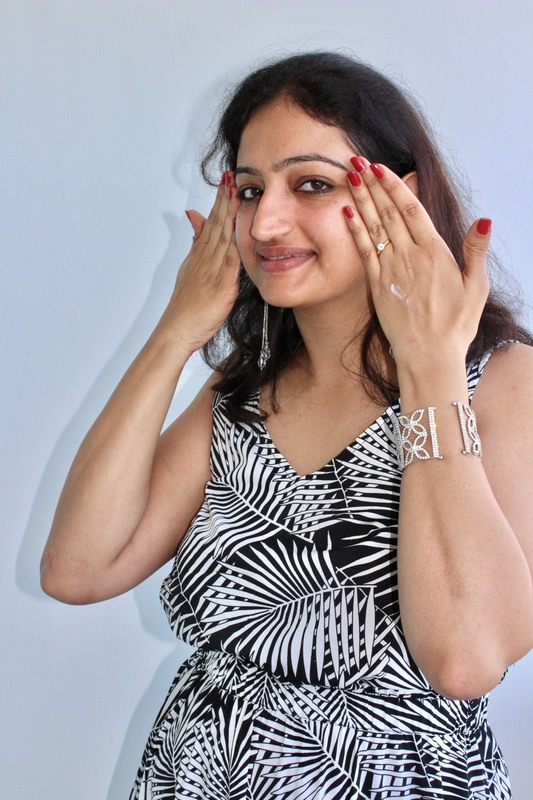 Just use your ring finger to pat the eye cream around the eye area before the final step! Wait one minute before the next step! 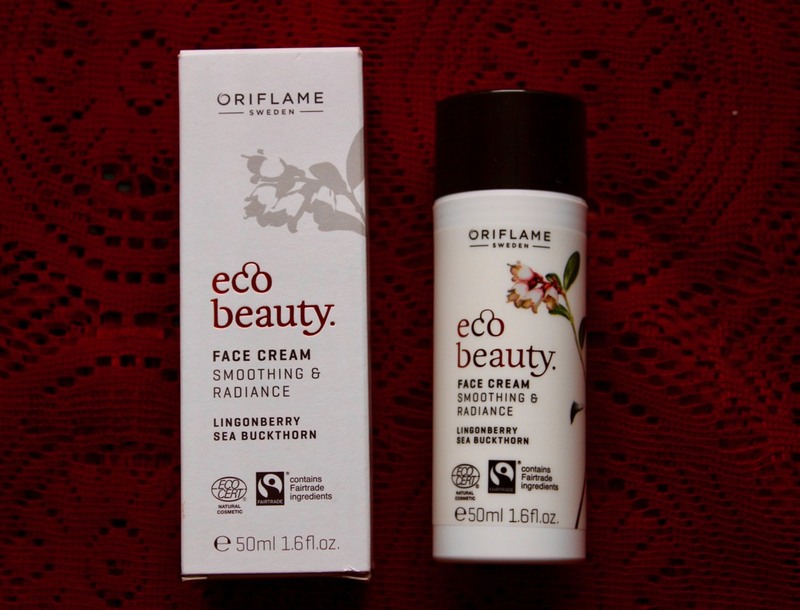 The EcoBeauty Face Cream is intensely hydrating cream which nourishes and brightens skin. So say goodbye to the sallow, tired looking skin. Infused with Arctic Lingonberry and Sea Buckthorn Seed Oils rich in Vitamin E, fatty acids and antioxidants, it helps to protect skin and maintain its natural hydration. So be prepared for softer, smoother and brighter skin! 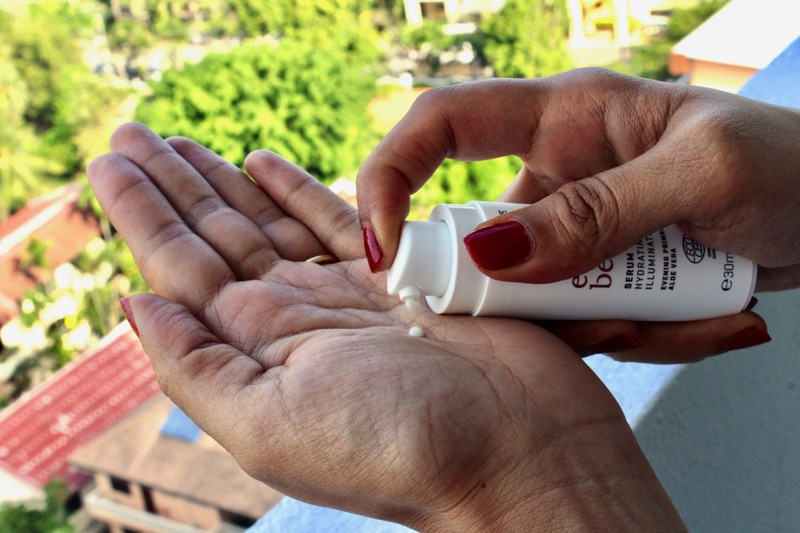 To check you are using the right amount, apply it to the back of your hand rather than dotting moisturizer onto the face then rubbing it in, warm it between your hands to activate the ingredients then use firm upward motions from the centre of the face towards the hairline where the lymph nodes are located. This aids detoxification. Wait three minutes before the next step! 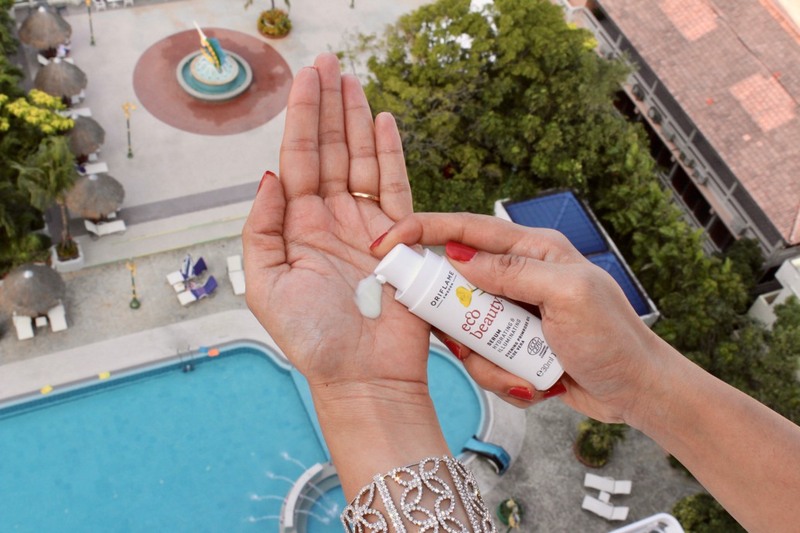 You can now go ahead and apply the sunscreen followed by your make up! The Eco Beauty range has an Ecocert certification which guarantees optimal use of natural ingredients. 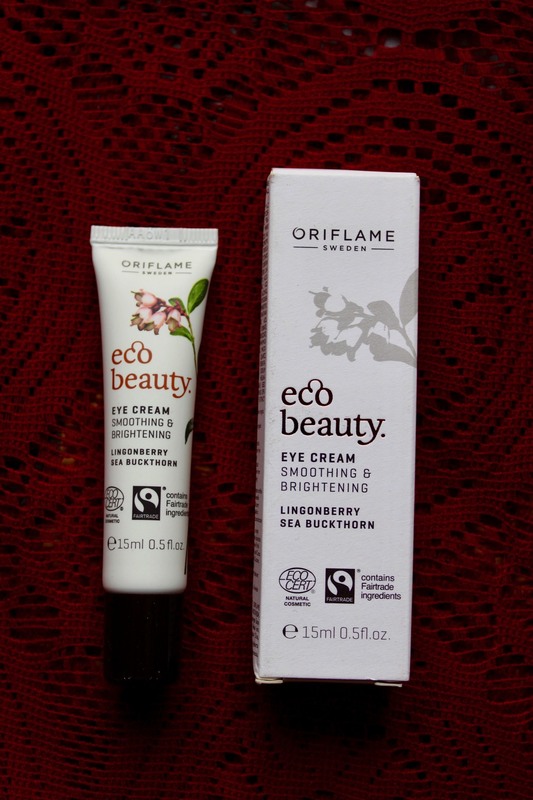 The products are also certified by Fairtrade and FSC. What are you waiting for? Contact your nearest Oriflame consultant or SMS Oriflame to 59994 and rediscover naturally radiant skin. Organic rose water? Wow, what a find! You are speaking my language dear… <3 this post thank you for sharing!